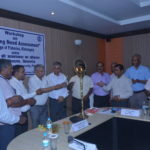 A one day workshop on Training need assessment for fishery farmers of Bihar was organized by Bihar Animal Sciences University on 10th July, 2018 in the conference hall of University. 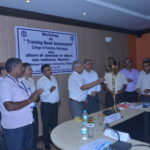 The workshop was inaugurated by Hon’ble Vice –Chancellor, BASU, Dr. Rameshwar Singh by enlightening the lamp. In the inaugural session, Dr. Rameshwar Singh welcomed all the participants and described the vast possibilities of fisheries in the North Bihar. He emphasised need of fishery farmer’s organization. He told that newly constituted fishery college in Kishanganj will pave the way for all round development of fishery sector in the state. Integrated farming of fishery along with animal husbandry will improve the socio-economic status of the farmers of the state. He informed that at present number of Government fish pond is very less. 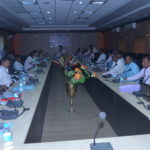 Dr. Kamal Sharma, Chief Scientist, ICAR-RCER, Patna told that there is need of specific training to fishery farmers of different agro-climatic zones of Bihar. Dr. Akhlakur Rahman from CIFE, Muzaffarpur suggested to organize “Fishery Farmers Day” in order to create awareness among fishery farmers of the state. On this occasion OSD, College of Fisheries, Kishanganj, Dr. K. G. Mandal, Advisor Fishery, Dr. Dilip Kumar and Dr. Suman Kumar, Dy. Director, Fisheries, AHD, Bihar also expressed their views on this occasion. In the workshop Dr. Ram Kumar, Assoc. 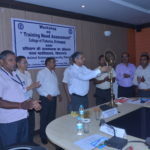 Professor, CUB, Dr. A. K. Thakur, Director Extension Education, Dr. M. N. Singh, Dean, SGIDT, Dr. S.R.P. 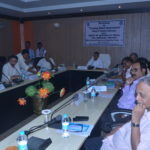 Sinha, Dr. Saroj Rajak, Dr. Sanjay Kumar, Dr. Kaushlendra Kumar and 30 selected fishery farmers from the state were present.